Knowing where to shop for your engagement ring is very important. Finding the engagement ring store that gives you the experience and knowledge you desire during this special time in your relationship is a must. Duff’s Fine Jewelry in the Dallas/Fort Worth Metroplex, takes special care to build a shopping experience around you and your needs. From the beautiful environment in their stores (the newest Duff’s is their Keller location) to the always knowledgeable and helpful staff, Duff’s has grown and thrived because of the memories made and the loyalty they have earned from their customers. Duff’s Fine Jewelry of Flower Mound and Keller, Texas is our Coast Diamond Retailer of the Week, and hopefully of your lifetime. The moment it becomes clear which engagement ring is yours is an exciting time. Which one of these Coast Diamond engagement rings will you celebrate as your own at Duff’s Fine Jewelry. This Coast Diamond cushion shaped engagement ring (LC5457) is framed by strings of diamonds that twist down the sides of the ring. Created for a one carat round diamond center stone of your choice, this engagement ring is sparkling with sophistication. The lovely Coast Diamond rose gold six prong engagement ring (LC5250-RG) is a timeless choice for the love of your life. The warmth of the rose gold setting is what every bride dreams of. The one carat center stone, set in white gold, is the finish of perfection. The graceful Coast Diamond oval shaped halo engagement ring (LC10233) elongates the brides finger. The delicately set diamonds around the halo and on the shoulders of the ring compliment the one carat oval diamond center stone, as well as your choice of Coast Diamond wedding band(s). Your engagement ring shopping experience can start today at Duff’s Fine Jewelry. Choose from two convenient Duff’s locations in the Dallas area and don’t forget to #ShowyourCoast. Congratulations to Duff’s Fine Jewelry for being our Coast Diamond Retailer of the Week! When cut, color, carat and clarity are the first things you think about when you think of engagement ring shopping, then you need a jeweler that is a step above the rest in their diamond inventory. You can’t get diamond center stones any more direct than Diamond Cutters of Western New York, unless you put on a miner’s hat. They have a fabulous inventory of diamonds to create exquisitely detailed, perfectly finished Coast Diamond designs. However, don’t think it’s just about the Four Cs. It is Diamond Cutters’ mission to empower couples, while making diamond purchasing the romantic and enjoyable experience it should be. Shopping for your Coast Diamond ring at Diamond Cutters of Western New York is the complete experience and we are happy to call them our Coast Diamond Retailer of the Week. The exquisite Coast Diamond oval halo engagement ring (LC10233) has delicately set diamonds on the shoulders of the ring. The appeal of an oval cut diamond is that it looks larger than a round cut diamond and it elongates the finger. From the Charisma Collection, this Coast Diamond 1.50 carat engagement ring (LC10360) with two rows of diamonds on the shoulders is one beautiful sparkler. With its solitaire setting your choice of diamond center stone is flexible. Let the experts at Diamond Cutters show you some options to create the engagement ring of your dreams. This Coast Diamond band (WZ5012H) makes a statement with 1.86CT of fishtail set diamonds set in three rows across the top of the band. Wear it alone or pair it with your stunner of a Coast Diamond engagement ring. Enjoy shopping for your Coast Diamond engagement ring at Diamond Cutters of Western New York today! Congratulations Diamond Cutters of Western New York for being our Coast Diamond Retailer of the Week! Jim Summa has worked, studied and explored the world of diamonds and gemstones since he was fourteen years old. Today, he enjoys sharing his passion for diamonds with his hometown community of Kirkwood, MO, from the antique showroom of Summa Jewelers. Jim’s love of jewelry is evident when he spends time with a Girl Scout troop teaching them everything they need to know to earn their jewelers badge. The joy and interest shown on their faces is a reflection of his own. We celebrate Jim’s passion for the community and his love of diamonds being passed on to the next generation. We are thrilled to call Summa Jewelers of Kirkwood, MO our Coast Diamond Retailer of the Week. We want to know… Which one of these girls is a future Summa jeweler? From the Coast Diamond Charisma Collection, this 1.5CT diamond engagement ring (LC10360) has two rows of round brilliant diamonds on the band… The perfect amount of sparkle to capture her heart. This Coast modern halo engagement ring (LC5340-RG) boasts a 1CT diamond center stone and is surrounded by a diamond encrusted halo and split band. The warm rose gold setting is the perfect finish and makes it one of our most popular Coast Diamond engagement rings. Celebrate that special moment with this Coast Diamond band (WC5180H) with 0.30CT of fishtail set diamonds. For a birthday, a graduation, an anniversary, or simply a little extra sparkle for spring, you can’t go wrong with this pretty band of diamonds. Visit Summa Jewelers in their Downtown Kirkwood location to find the Coast Diamond ring that celebrates the one you love. Then share it with us with #ShowyourCoast. Congratulations to Summa Jewelers of Kirkwood, MO for being our Coast Diamond Retailer of the Week! 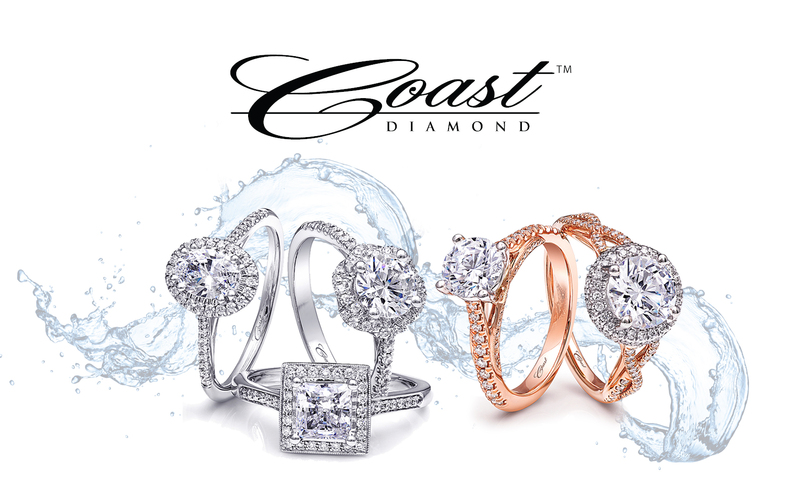 Stop by either store on Saturday March 10th and Sunday, March 11th to take advantage of special in-store promotions featuring Coast Diamond engagement rings and diamond jewelry, including 24 Months Special Financing!